Finished this up, didn't take long. Very happy with it! Not much to say. Off to the next one! 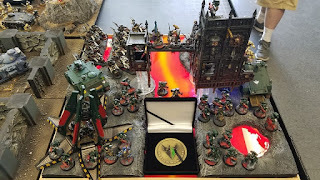 Orks faction focus and 8th edition - HOLY CRAP!!!! Now that the faction focus has landed, and we know how morale is going to work, we can get a good feel on how Orks will be in 8th. I will call it the “conga line” edition. First, the highlight from faction focus is by far the Mob Rule. I could not have written it better myself! Just like in 4th you can substitute the units LD for the number of models. However, unlike 4th, there is no cap at 10. Which means a unit of 30 suffering 10 losses still has LD20 and can’t lose any more to morale!! An opponent would have to kill half a unit of 30 in a single turn just to have a chance to do any more damage. I’m in total shock about just how freaking awesome that is. Plus, there is more too it, you can use a unit’s nearby LD which means even the small elite units will be sticking around a lot more. And on top of it nobs and warbosses can mitigate any losses from morale! My biggest fear was suffering from battleshock/morale and while it’s not quite fearless it’s exactly what it should be. Nobs only have 3 wounds, which is a bit disappointing. I was hoping for 4. I was also hoping choppas would be ap -1. Let’s talk about the conga line. It was a typical trick in the 4th ed codex because the cover save from the KFF was by unit, not models like the current book. Now, it will be both unit and a 5++!!! Absolute best possible world. Add in the 6+fnp from a painboy effecting all nearby units, and no longer having to remove closest models from shooting means you’ll be able to run a horde of Orks with a 5++/6+ all the way across the table! This is EXACTLY the kind of survivability I’ve been saying all along the Orks needed more than anything. Add in ‘eavy armor upgrades? Giving all the nobs kombi-skorchas might not be a no-brainer, but pretty close. Since combi- weapons are no longer 1 shot having a heavy flamer in every unit sounds like a good idea, and again, since model removal won’t be closest, you can put the nob out front right and propa’! The waggh! is changed to units within 6” of the warboss, but it also implies it’s not just once per game, which I think is a great tradeoff – because of the conga line. It’s like the Decurion all over again, only better. Reece said to dust off the killa kans, which to me means they were fixed. I sure hope so. They are currently so overpriced and nearly useless. I mean S7? Sigh. I hope there are a lot of things fixed. I am surprised there was nothing about Trukks, which are as iconic as a Rhino, in the faction focus. I’m still putting in for a decent version of Ramshackle…my dream is you only take 1 wound from multi-wound hits. I said before lone SAG meks hiding in the back will be a thing. I’m sticking to that, but it will depend on how they work. Assuming strength is 2d6 with d6 (or even 2d6) shots and ap -3 it could be a quite nice..and on a roll of 12 they are moral wounds! It sounds like characters still won’t have access to 5++, but hopefully something will give them survivability in close combat. With the transport rules you can put multiple small units is a single transport – say 4 units of 5 lootas in a battlewagon – and give them much more protection than they have now. With the change to twin linked, will warbikes really get 6 shots? I think I prefer the old TL, especially with overwatch but that is A LOT of dice. Let’s talk about Da Jump, as spoiled in the article. It allows you to pick up a unit and place them 9” away from any enemy units. No scatter, and they can still charge. Combined with ‘ere we go re-rolling, that’s a pretty good chance (about 1/3) of making that charge. I can see literally building an entire list around that power, with first turn transporting 90 boys just 9” away from the enemy. And with the changes to blasts and flamers, you no longer have to fear having the boys all bunched up if you do fail the charge. Of course it’s not all sunshine and roses…but to be honest it’s pretty darn close. The change to heavy weapons getting a -1 to hit instead of snapshots is a big boost to other armies but it’s the same for Orks either way. And as with all the 8th ed spoilers so far – points! There are far more questions than answers. Will there be instant death? Will there be limits on Megarmor? Will characters have different dataslates for MA option? How will exhaust cloud work? Will bikes be as good as they are now? How will Snikrot work? I started these months ago but they were interrupted with Dark Angels. They are based on UFO lamps from the prize pool at my local pizza parlor (no, not the mouse one). They had a nice battery compartment and switch already so it was pretty easy to move on from there. The paint job is stupidly simple yet very effective. Very happy with them! It's been a long time. Seems like I've been painting Dark Angels forever, but in reality it's only been 4 months. I finished the UFO's and now to the next project. I bought this Trukk used back many moons for just $16, and it's been sitting forever. Not only because of the DA but I didn't know what to do. Well it hit me a couple days ago what to do - Rat Rod!! I started by tearing it apart, luckily it was put together with superglue not plastic glue. It didn't take long to figure out the suspension. Mostly it just takes cutting off the leaf springs from the frame and inverting the axles. I also realized the cab is designed to have the driver on either side, so for something different I went right-hand drive. I really LOVE how it came out, absolute perfect representation of a Rat Rod. It will painted just like the UFO's, very rusty - true to the namesake. GW has covered an overview of just about all the rules at this point, but still there are A LOT of questions left unanswered. While we got to see a dataslate for thousand sons, and a few other weapon spoilers, we will have to wait and see. We know the Morkanaught has 18 wounds and a 3+ save. I might just have to save up for one now! Though I'll probably use the Gorkanaught instead. However it might have a completely different table. I'm also hoping for the forgeworld units: Mek Stompa, Zhadsnark, War Kopta, etc. They have a tendency to leave Orks in the dust on these things. Ramshackle: Every unsaved hit can only do 1 wound, regardless of weapon profile. This would bring the Trukk truly back: able to make it across the board and deliver it's deadly cargo. Yet still have a good chance of dying to any sort of concentrated small arms fire. AP4 seems to translate to AP-1. But Deffguns are the heavy weapon of Orks, having them just 1 damage seems very underwhelming. The downside to so many wounds is of course, losing whole models to morale. But MANz are usually fielded in small enough units so it won't matter. Nobs should have double the wounds of Terminators. Notice how I didn't put down any points. The point system will be so completely revamped that any speculation is meaningless. 1. Since Megarmor is such a different profile than non-MA, will characters be split up? So we have one dataslate for MA warboss and one for non-MA? Or will it just be different profiles on the one dataslate. 2. Painboys/FNP. How will they work? Will FNP even be a thing? 4. Will Warbikes actually get 6 shots?!?! 8th can not get here soon enough. I still have my weekly 40k league and other chances to play. However it's getting harder and harder to do anything other than go through the motions. No point in building new lists, no point in practicing anything, just..no point. A bit of Osborne effect here. GW has released so much information so far ahead of the game that I'm sure their sales are non-existent and getting people to throw dice is getting harder. I will probably revisit old lists, like an old comfy blanket, over the last month of 7th. Last week I played basically random Dark Angels models I had painted. I think next week will be the last run of Sammael + thunderwolves. I would like to play the 180 boy decurion before it goes. One more run with a Ghazzy decurion as well. If time I'll play the tau/necrons one last time. I really like the optimized stealth cadre. That's 4 weeks. That should be the last of 7th. really 7th can't get here soon enough. 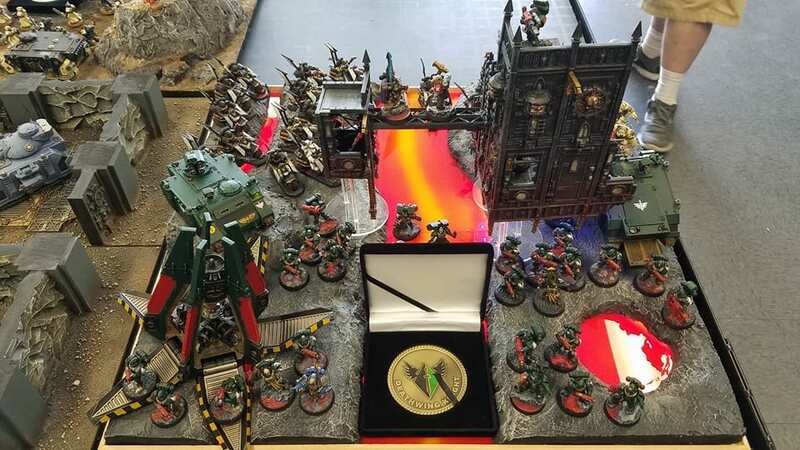 Battleshock comes to 40k 8th edition - and I'm not happy about it! Today was the big morale teaser. Not very big for most armies, but when it comes to Ork it's devastating. Basically it's exactly the same as battleshock in AoS - add d6 to the number of casualties and subtract your leadership. Then remove the number of models from the unit equal to the difference. I've played my Orcs in AoS and battleshock does as much damage as the opponent. It's not uncommon to lose 5-10 models a turn from a large boyz unit. In fact, we plan on it - that's the whole point of running units of 30. However my experience in AoS is large units of fragile infantry is a recipe to throwing away a lot of points. the roll is irrelevant if you've already lost more models then your LD value! The only saving grace will be whatever they do with Mob Rule. Making units larger then 10 immune to morale, or if it started with more than 10 on a 4+ the model does not run away, something..anything. Otherwise horde Orks is a non-starter from the get-go.